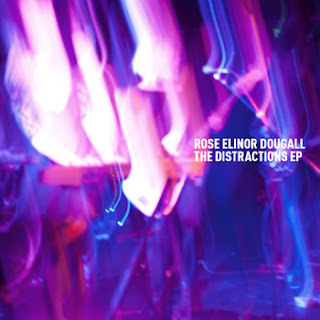 It's been difficult to get a full grasp on the solo material of former Pipette Rose Elinor Dougall. Although pretty and perfectly listnenable, there was much about her debut album Without Why that remains sadly forgettable. Or perhaps you need a more finely tuned ear and greater patience. Dougall's songs aren't those that instantly get to you, rather the delicate layers are supposed to seep into yr consciousness over multiple listens. With that in mind, fans of Without Why won't be disappointed by The Distractions EP, but neither should anyone else be either. At the start of first track 'The Night' cinematic Morricone-style guitar and stomping steady drums recalls Anna Calvi's dramatic pop as it floats by, anchored only by Dougall's voice. This dreamy intro gives way to the sea spray of some British Sea Power-aping guitar and crashes of cymbal. It's more robust than you might expect with more than a passing resemblance to 'Lights Out For Darker Skies'. Which as we all remember, was excellent. 'I've Always Known' takes it's intro cue from this, before heading in a more pop focused direction. The croon of our leading lady is less buried than previously with a classic stomping drum beat providing a safe bed from which to play off. This more than ever before feels like Rose taking a solo turn from The Pipettes, a more mature solo pop venture and a rather decent one too. With final track 'Hanging Around' (which at over four-and-a-half minutes it could be argued hangs around too long) Rose provides perhaps the most accurate representation of the EP as a whole. Both pop and rock influences mash together perfectly as the swing of the chorus slides over scratchy guitars. Lyrically it turns some of the themes of unrequited love on it's head with lyrics such as “I know love / I've had love / and it's not what I want from you”. So, although it's perhaps pining it's certainly not mushy. Although yr left with the feeling that some backing harmonies on 'Hanging Around' could better highlight Rose's incredible voice, the song is otherwise rather solid. Much like the EP as a whole then. For what seems like either a stop-gap, or a reminder of Dougall's existence this is rather enjoyable.